I didn’t upgrade to Mac OS X 105 “Leopard” when it came out – I read enough horror stories about it being a mini-Vista, the first major OS release of recent years where Apple really screwed up and broke a lot of things for a lot of people. After a while and a couple of maintenance releases, I assumed it must be stable and largely working, but I still couldn’t see that it offered anything new and compelling to justify the expense, hassle and risk of an upgrade. 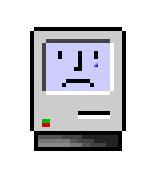 I’ve been using Mac OS X since 2002. I can’t remember if I started on 10.1 or 10.2, but in any case I made it to 10.4, and then up to patch level 10.4.11, without any of the upgrades encountering the slightest glitch. This is why people buy computers from Apple. 10.4 to 10.5? Glitches. Great big nasty glitches. My mail disappeared. Getting it back turns out to be a simple matter of just temporarily moving a couple of files, but still. My mail. Ten years of people’s addresses. Probably the most irreplaceable thing on most people’s computers. My trust and confidence shattered immediately by the first thing I look at. I have a fairly recent backup (yes, I know, I should have had a backup from right before the upgrade. But my previous experience with frictionless Apple upgrades has evidently made me not paranoid enough.) How could they still have a huge bug like that 10.5.6? This genuinely surprises me, and makes me I’m sure less tolerant than I otherwise might have been of the the other little glitches and irritations that follow. 403 Forbidden, says Safari when I attempt to access my local working copy of alanlittle.org. Half an hour’s googling later – half an irreplaceable hour of my valuable life wasted, thank you so much Apple – I learn that following these instructions changes the error message, but doesn’t fix the problem. Following these instructions does fix the problem, and is simple as long as you’re not afraid of a command line and a text editor. Many people are, however, and Apple’s programmers (who aren’t) could easily have taken care of this automatically if they could have been bothered. It's caused by the fact that 10.5 uses a later – and presumably better, it’s ten years since I was last well-informed about such things – version of Apache, and the new version needs to be configured differently. Fair enough. Would it really be beyond the bounds of Apple’s developers’ ingenuity to notice that one is upgrading an existing installation, and create the one file needed to make this work? Cmd+> (Apple key and “less than” sign) doesn’t tab between different windows in the same application as it used to, and is supposed to, on German Mac keyboards. In some applications – web browsers and text editors for example – this is crippling. I can turn it back on by editing the keyboard shortcuts in System Preferences, but I shouldn’t have to. The machine knows it has a German keyboard, and it was working properly before. My 3G wireless connection software is suddenly much slower and flakier at detecting the phone. I often have to reboot the phone. Having finally established a connection, the connection manager then often, but not always, runs at 100% cpu, spinning up the fan loudly and eating battery capacity. Not Apple software, I know, but it worked perfectly well before and now it doesn’t. UPDATE: connecting works fine as long as I ensure the software is running before I plug the phone in. Still rather far from Just Working. Choosing English as the installation language doesn’t make English the default system language. Nor does having had English as the default system language before the upgrade. At least not consistently. Applications I already had before the upgrade still seem to appear in English; new ones come up in German until I go into System Preferences (or, sometimes, “Sytemeinstellungen”) and switch my preferred language to English there too. A small thing, but irritating, especially when all the previous things have already shaken my confidence and patience. And Apple are supposed to be about getting the small things right. Leopard refused point blank to install on my desktop Mac, a perfectly adequate and smoothly functioning three year old G5 Powermac. Having been through the experience on the laptop, I can't say I'm sorry and have decided to leave my working system well alone. On the not-broken-but-different front: some things seem a bit slower, most things feel a bit quicker. Icons are generally larger, more 3D and brighter, which I find loud and dislike. There was never anything wrong with little flat grey folders. Fonts are generally bolder and more contrasty too – something improved in the rendering? – which I found a bit jarring at first, but after a day I like it already. Icons bounce in the dock in a more staccato, less fluid manner that pisses me off. We really are nitpicking now. I don’t like the translucent menu bar at first, but after a few minutes’ googling after hacks to fix it, I conclude that the hacks don’t seem that good, and lots of people seem to think one gets used to the menu bar after a while, so I’ll leave it for now. All in all, a considerable amount of hassle for insignificant gain. I really shouldn’t have bothered. UPDATE: Tim Bray is singing the Mac upgrade blues too. I decided I needed to broaden my photographic perspectives, and a friend of my wife who was visiting us noticed that the Haus der Kunst has a show at the moment by William Eggleston. This seemed like the ideal opportunity: Eggleston is a very famous and much admired American photographer and not a Magnum photojournalist. I’ve seen bits of his work in books before, not much, found it quite interesting. The pictures on the exhibition webpage were good. So off we went. One of the things Eggleston is famous for, that museum curators still like to bang on about, is being one of the first people to do “serious” “art” photography in colour. So what? There’s a certain type of arts person still obsessed with fighting the New York art clique wars of their youth. Get over it. It was half a century ago; there’s no reason to care any more. It doesn’t matter what was controversial then; either the stuff is still interesting to look at on its own merits now, or it isn’t. And it very definitely is. It doesn’t speak to me, much, but I can see why it does to a lot of other people. Eggleston himself clearly isn’t too hung up on particular media and technologies. Most of the major photographic printing techniques of the last half century are here. In the sixties and seventies he was evidently a big fan of the horrifically complex, obscure and expensive dye transfer process. There are lots of conventional colour and black & white prints, and – some of the most interesting pictures in the show, for me – some big, recent inkjet and Lightjet digital prints of older negatives, both colour and black & white. A couple of b&w portraits – not at all the sort of thing Eggleston is famous for – impress me very much indeed. In the interest of further thwarting my perspective-broadening, the Versicherungskammer Bayern’s next exhibition after Magnum’s First is, once again, Magnum founder George Rodger. I could always not go – in the interests of avoiding having my perspectives kept narrow. But I think I most probably will. (*) Michael Blowhard, for whose opinions I have a great deal of respect, wrote here about his admiration for Lee Friedlander. (**) Not American, but famous mainly for photographs of America and generally said to be hugely influential for/by lots of famous American photographers.